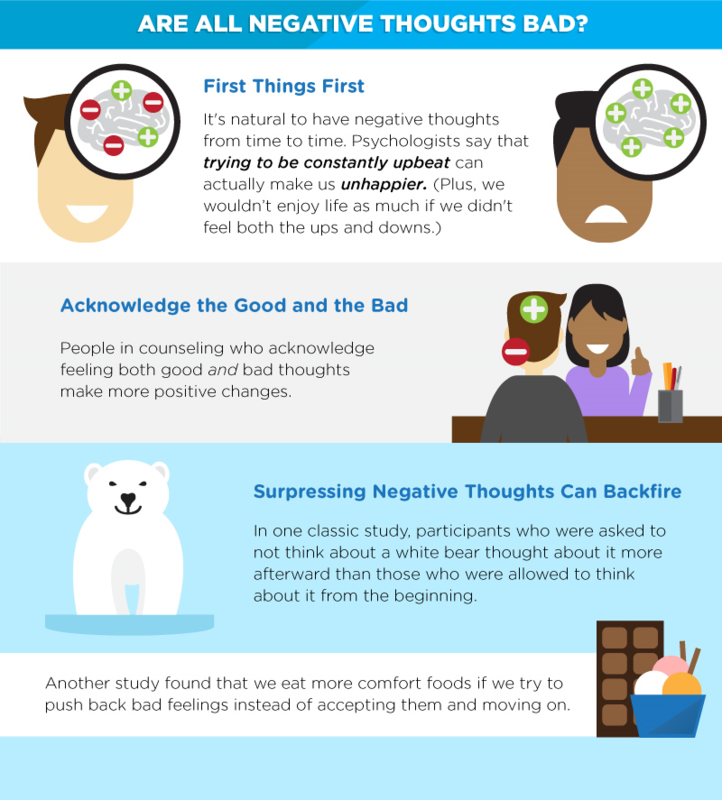 Negative thoughts are actually vital to our well-being and mental health, according to recent studies. In an article for Scientific American, psychotherapist Tori Rodriguez pulls together some of this research, and explains the role of emotions such as anger and sadness in the human experience. Ignoring or suppressing these negative thoughts can have a range of unwanted effects on our mental health and well-being. “Unpleasant feelings are just as crucial as the enjoyable ones in helping you make sense of life's ups and downs,” she explains. Without the negative we cannot evaluate our experiences, or experience true sense of satisfaction. What’s so good about the bad? Rodriguez draws on a range of research to outline the positive consequences of negative thoughts and emotions. Attempts to suppress feelings such as anger or sadness can actually reduce our sense of contentment. Despite society’s bias towards positive thinking – which can result in people feeling embarrassed about negative emotions – being constantly upbeat carries its own risks. First, suppressing thoughts means we cannot accurately evaluate life’s experiences. If we don’t allow ourselves the lows, then the satisfaction from the highs becomes lessened. As the author explains, “attempting to suppress thoughts can backfire and even diminish our sense of contentment”. Finally, the act of suppressing thoughts and feelings can be bad for our physical health and cause stress. A Florida State University study showed that those who suppress emotions experience greater stress when confronted with the topic causing their negative thoughts. How can you accept negative thoughts? Accepting negative thoughts and emotions can actually lead to greater clarity and understanding of our life, argues Rodriguez. She suggests a number of strategies to help us accept negative emotions, suggesting you should “acknowledge how you are feeling without rushing to change your emotional state”. From mindfulness to writing a journal, a shift in perspective and learning to tolerate strong emotions could help us. Ultimately, we have to accept the rough to make the smooth that much better. Have you read? Which country is the world's happiest? A history of well-being - and our understanding of it Which country has the highest level of well-being?